We are big Alex Gibney fans here as we’ve made clear on a few occasions. We are not big cycling fans. All that lycra and sweating sinewy people straining every horrific muscle to get up a mountain for… well, for now good reason that we can see. Not for us. So Gibney’s latest comes as something of a mixed blessing. But then, who doesn’t like to see an arrogant rich man get brought back down to earth? The Armstrong Lie began life as a very different film from the one that Gibney ended up making. Initially based around Armstrong’s 2009 comeback Tour, the movie was supposed to document a near miracle return to winning after an enforced layoff with testicular cancer that had spread to the cyclist's brain, lungs and abdomen. Already an all American hero after winning the Tour de France seven consecutive times between 1999 and 2005, any documentary maker’s eyes would light up at the opportunity to get the know cancer free hero up close and to document his presumably winning return. It was of course, all too good to be true. Armstrong only managed 3rd in 2009 (the use of the word ‘only’ is meant to be ironic given his illness) and his world was about to get a whole lot worse. 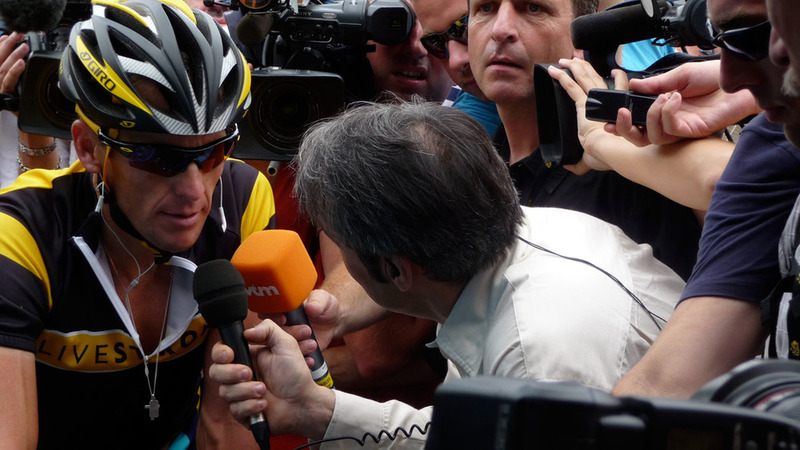 Having viciously and litigiously denied a variety of doping rumours, Armstrong was finally forced to admit his complicity when the USADA charged him with drug use in 2012. He was stripped of his Tour wins and in January 2013, Armstrong appeared on the Oprah Winfrey show, ostensibly to admit his guilt and a variety of sponsors began legal action against him. So, Gibney was forced to split his movie into two. The first half following the man as he faces the kinds of challenges a cyclist recovering from cancer would, the second picking up after the Oprah interview following a shattered drug cheat as he… well, what exactly does he try to do? The issue with Armstrong and therefore the issue with The Armstrong Lie is that despite all the evidence, he does not believe he’s done anything particularly wrong. I say that’s the issue with the movie, maybe that’s the point of the movie but it’s debatable. For all the supposed contrition and admissions of guilt, it’s very clear by the end that Armstrong is actually pretty happy with himself. After all, everyone was cheating and he cheated best. So what we should get is a damning indictment of sport / America / the world’s obsession with winning at any cost and damn the consequences because money has taken over! Right? Well, this isn’t that film. But that’s not to say it isn’t worth watching. The issue Gibney quite openly admits to having is that he was the mega-fan who got his dream job. A huge respect for Armstrong, especially built upon over the months spent with him pre-guilt, doesn’t disappear quickly and for once you get the sense that Gibney may have got too close. I’m not accusing him of polishing the lycra-clad turd but you do wish for a wider condemnation of the man. A Richard Nixon moment if you like. A moment when Gibney finally gets through to Armstrong and he breaks down in real tears, admitting how much he has let down everybody. And Gibney does ask the right questions but maybe Armstrong has built up too bigger wall to get through, I certainly didn’t come away from this movie thinking that Armstrong had been treated harshly by the authorities (as Armstrong himself clearly does). Insights into how Armstrong treated those close to him, especially those he considered to have wronged him are genuinely shocking and the interviews with people affected by cancer are mortifying but you get no sense that any of this is sinking in with him. It’s likely that I’m judging this movie too harshly in relation to Taxi to the Dark Side and Mea Maxima Culpa and that’s unfair as this was never going to be as important as those movies. Gibney does a great job of shining a horrible light on the arrogant, unrepentant and wholly unlikeable cyclist and it’s not really his role to judge, that’s for us to do. Which, given the adjectives I just used, you can probably tell I already have. The Armstrong Lie reads as much as a long lament by a mega-fan who feels gipped by his hero and just can’t believe that’s what happened. If you’re at all interested in cycling, this is essential viewing as the insights into the murky world of big sport governance are fascinating. But if you’re looking for a fallen hero breaking down and genuinely admitting his faults, you’ll get nothing here. As far as Lance is concerned, his only fault is that he finally let them catch him. Otherwise, he was the king of the dope cycling world.